In order to balance the electrical charge, the cell balances sodium and potassium ions inside and outside the cell to keep the electrical charge at the appropriate level in the cell. In order to balance the acidity, the cell balances hydrogen ions (H+) to keep acidity at the correct level. Both the electrical charge and the acidity determine the shape of the molecules of the cell. The shape of the molecules determines how well the molecules and cell function. Potassium and sodium determine the electrical charge. They are positively charged ions, called cations. They determine the charge across the cell membrane and across many of the interior membranes. This charge across the membranes influences many of the chemical reactions in our cells. But what about the negatively charged ions (anions)? Positive and negative charges must be almost equal. There is strong evidence that these anions control the acidity of our blood, our cells, and our fluid between our blood and our cells. This acidity surrounds protein molecules in our cells. 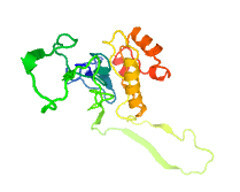 It has a major influence on the proteins' shapes. And a protein's shape determines how well it functions. The levels of different anions (negatively charged ions) in our blood and in our cells are determined through mechanisms at work in our kidneys. Humans produce acid as part of how the body functions. When we exercise, we produce a great deal of acid. But even at rest, normal cell processes produce a great deal of acid. Most of this acid is eliminated as carbon dioxide that is exhaled through the lungs. Each day 15,000 mmol of acid are eliminated in this way. The acids leading to carbon dioxide are called the volatile acids. The way that the volatile acids are eliminated is by using the large buffer pool of bicarbonate in the blood to combine with the acid ions. Bicarbonate ions (HCO3–) are alkaline ions that combine with acid ions (H+) to form H2CO3, which degrades into carbon dioxide and water. The chemical reaction is H+ + HCO3– = H2CO3 = H2O + CO2. We also have acids in our bodies that are called non-volatile acids. They cannot be exhaled through the lungs. They come from our food, and they must be eliminated through the kidneys. 40 mmol of this type of acid are eliminated in the urine by making ammonium. 70 mmol are eliminated in the urine with titratable acids. For you chemistry buffs, titratable acid is used differently here than it is in chemistry. It means the amount of NaOH to bring the urine pH back to 7.4. It measures the amount of H+ that is associated with non-bicarbonate buffers in the urine. These buffers are mostly phosphates, but also include sulfates and a few other anions. So there is over 15,000 mmol of acid being neutralized each day. This consists of 110 mmol of non-volatile acids being neutralized and 15,000 mmol of bicarbonate being exhaled. With so much bicarbonate being used up every day, there must be a source to replace it. There are two main sources that replenish bicarbonate in the blood stream. The two sources are the kidney and the diet. Bicarbonate is produced in the kidney when acid is excreted into the urine. This occurs in the alpha intercalated cells, discussed below. And the remainder of our bicarbonate comes from food in the form of bicarbonate precursors. Bicarbonate precursors are molecules that our body turns into bicarbonate. The food precursors of bicarbonate are abundant in plants. There are many different precursors, but among the most common are citrate, lactate, acetate, and gluconate. Although you do not have to become a strict vegan to have an adequate supply of bicarbonate, you do need to eat enough plants to neutralize any excess acid that your kidneys cannot handle if you are to remain healthy. This will help keep your cells at the correct acid level (pH). A beautiful model now exists that tells us how sodium and potassium work together with bicarbonate to keep our levels of potassium, sodium and acid appropriate for cellular function. A recent review (1) of how chloride is conserved, and how bicarbonate is excreted in exchange for chloride, explains the most recently discovered piece of this model. The first clues leading to this recent contribution came from a 1975 study of the Yanomami, a modern indigenous group in the Amazon (discussed in this post). The study showed that the Yanomami's urine had a high potassium level, and a low sodium and low chloride level. This low chloride level gave recent researchers a clue about how chloride is preserved. The chloride level was so low that their urine had to be alkaline. But how could chloride be exchanged for alkaline ions? At the time of the 1975 study, it was unknown how this happened. It was not known how chloride could be preserved when so little was eaten in the diet. The Yanomami only excreted 10 mmol of chloride per liter of urine, indicating that they conserved it a great deal. Westerners usually have 110 to 250 mmol of chloride per liter in the urine. But recent studies have shown how chloride can be so highly conserved. The mechanism has been summarized in the review article (1) to be discussed today. A molecule that was described in 2004, named pendrin, was originally discovered in patients with a particular type of congenital syndrome involving the loss of hearing. Later pendrin also was discovered in cells in the kidney. Researchers found that pendrin in the kidney conserves chloride by excreting bicarbonate into the urine. Pendrin is found in the beta intercalated cells in the distal convoluted tubule of the kidney. When chloride needs to be preserved and there is sufficient bicarbonate in the blood, pendrin in the beta intercalated cells will pull chloride from the urine into the cell in exchange for bicarbonate. But pendrin is not the only character in this story. In the kidney there are other molecules (exchangers and transporters) that fine tune sodium, potassium and acidity. The exact interaction of all these molecules has yet to be determined. But the protective role of pendrin has been determined. And aldosterone also plays a role. A recent finding is that, just like it does in the balancing of sodium and potassium (discussed in this post), aldosterone has a major influence on blood acidity. It does this by affecting the exchange of chloride for bicarbonate in the kidney. Aldosterone helps to keep the acid level of the blood optimal by affecting two types of cells located in the kidney. It affects the alpha intercalated cell and the beta intercalated cell. But it affects them in different ways. Aldosterone stimulates the alpha intercalated cell to secrete more acid into the urine. It stimulates the beta intercalated cell to secrete more bicarbonate into the urine. In this way aldosterone is a major player in acid-alkaline balance in our bodies. Aldosterone stimulates the alpha intercalated cell to excrete an acid ion, H+, into the urine in the form of ammonium. The alpha intercalated cell also excretes H+ as a titratable acid by attaching the H+ to phosphate or another negatively charged ion. When the cell does this, it manufactures a bicarbonate molecule, which it sends into the blood stream. But there is a limit to the conditions under which the cell can manufacture bicarbonate. When the urine acidity (pH) reaches 4.5 to 4.4, the kidneys are excreting as much acid (H+) as they can. At this pH the backflow of hydrogen ions (H+) into the blood stream equals the excretion of hydrogen ions into the urine. It can no longer manufacture bicarbonate. After the urine pH reaches 4.4 to 4.5, the body must find other ways to neutralize any acid it produces so that it can keep the blood pH at 7.4. It must pull bicarbonate or other acid neutralizing ions from stores in the body, such as bone. But unlike many modern humans, early humans did not have the problem of getting too little acid neutralizer in their diet. Early mammals, including humans, got a great deal of bicarbonate precursors in their diet, and could afford to throw bicarbonate away in exchange for chloride, which was much harder to get from the diet. They did not have to pull acid neutralizers from stores in the body. Their kidneys used pendrin in the beta intercalated cells to exchange chloride for bicarbonate. Aldosterone stimulates the beta intercalated cell to produce more pendrin. Pendrin pulls chloride from the urine in exchange for bicarbonate. Voila – two problems solved at once. Chloride is kept in the body and the extra bicarbonate is expelled. The bicarbonate neutralizes acid molecules in the urine. The more bicarbonate excreted, the more alkaline the urine. Large amounts of potassium usually accompany bicarbonate precursors in food. The large amounts of potassium stimulate aldosterone secretion. Aldosterone, in turn, stimulates the beta intercalated cell to produce more pendrin. Thus, when potassium needs to be expelled and sodium conserved, bicarbonate is also expelled and chloride conserved. So aldosterone is a critical molecule that helps get rid of extra potassium and extra bicarbonate while conserving sodium and chloride. Early mammals, including man, had difficulty getting enough sodium and chloride, because it was far less available in the diet than potassium and bicarbonate precursors. Aldosterone helped solve this difficulty. Since potassium and bicarbonate precursors were readily available in the diet, there was no reason to conserve potassium and bicarbonate. These ions were expendable and were traded for the sodium and chloride ions that were harder to get. Our bodies evolved to conserve sodium and chloride, and still have no way to get rid of excessive sodium and chloride. But our bodies are exquisitely fashioned to eliminate potassium and bicarbonate, since potassium and bicarbonate were always consumed in far greater amounts than sodium and chloride until the rise of processed food. So does this mean that your urine should be alkaline? And what would be the optimal pH of your urine? There are no definitive answers to these questions yet. But it does mean that your urine should probably not have a pH of 4.4 to 4.5, which is the lowest pH that the kidney can make. If the pH is this low, it may mean that you are unable to sufficiently buffer the acidity of your blood stream with diet. You must pull buffers from other storage areas in the body, such as bone. When the pH is 4.5 you are flogging your kidneys when they are already working as hard as they can. They can do nothing more. If the pH is above 4.5, all may be well. And if the pH is alkaline (greater than 7.4), it means you are definitely getting enough of the bicarbonate precursors and you can limit your sodium and chloride intake. Your kidneys have you covered. 1. Effect of mineralocorticoids on acid-base balance. Wagner CA. Nephron Physiol. 2014;128(1-2):26-34. doi: 10.1159/000368266. Epub 2014 Nov 6.